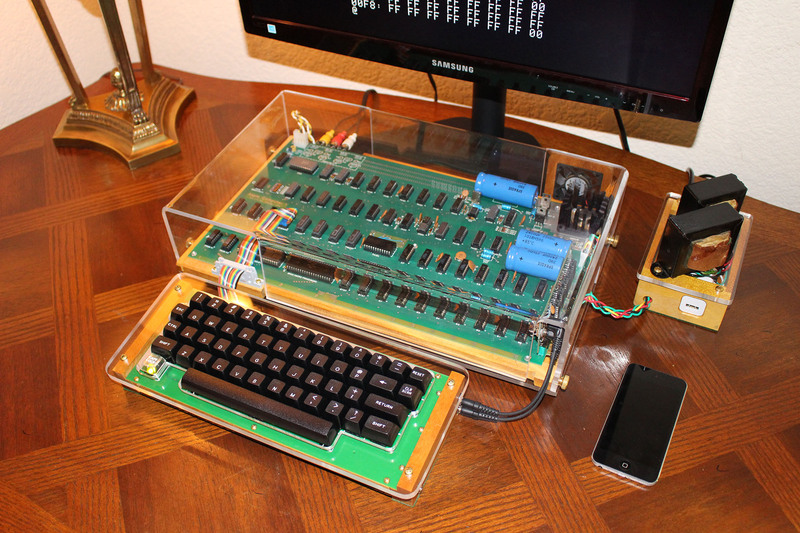 This case is designed for my Apple 1 but I am using a Mimeo as a stand-in. 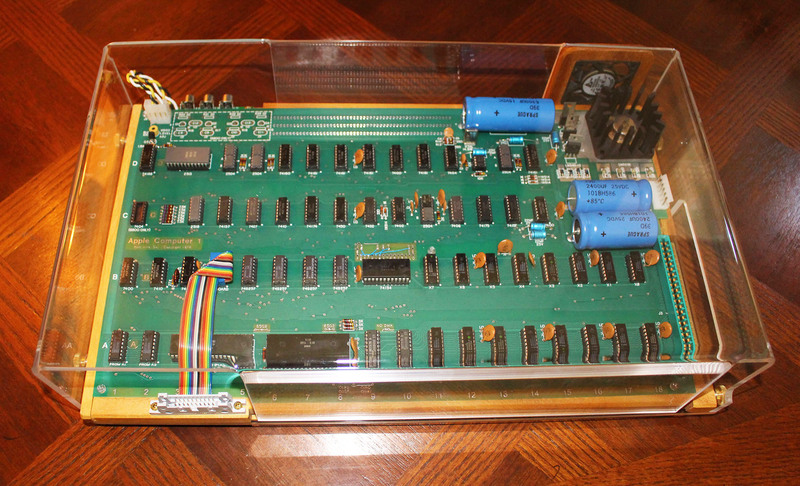 The objective of this Apple 1/Mimeo case is to provide an optimum display of the board in a compact modular configuration. This is intended as both an attractive exhibit unit and a demonstration unit. I usually use a 22 inch LCD TV for the monitor as this seems to be a good size for demonstrations and is still reasonably portable. The TV is on a pedestal mount that can float the monitor above the Computer so it does not interfere with the view. 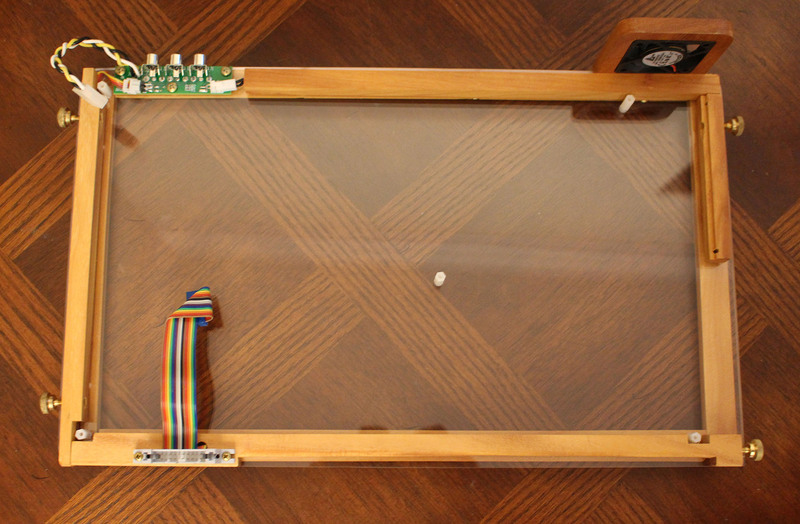 The top of the Apple 1 board is as unobstructed as possible even to the use of clear acrylic screws for mounting the board. The photos show the overall setup and views of the top and bottom of the main module and the base with no board mounted. All wiring, the power for the fan and the audio signal wires, are embedded in the wood framework so they are not distracting. 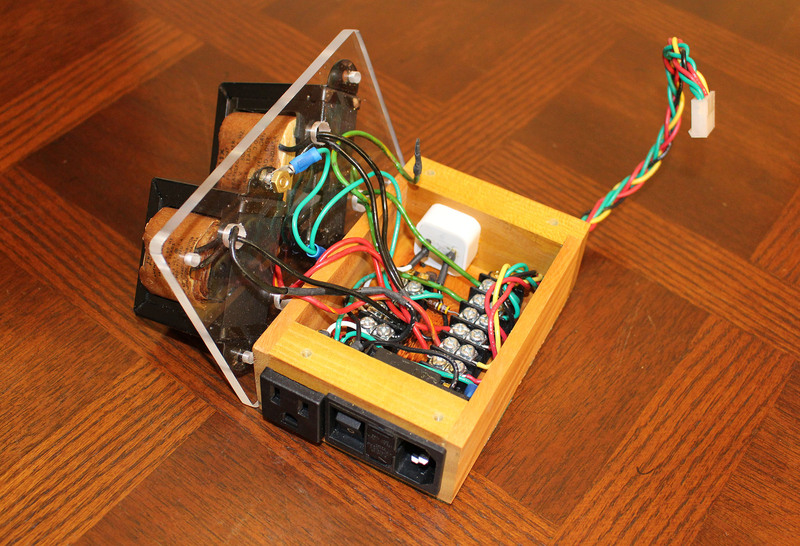 The custom keyboard is a full 128 char upper/lower case keyboard with autorepeat, it uses standard Cherry MX switches, The encoder daughter board also contains the audio circuitry to interface the ACI to an iPod or iPhone for both read and write. There is also an amplifier for the signal from the ACI and the audio ACI input and output are routed to the 20 pin header on the daughter board for connection to the main computer base. 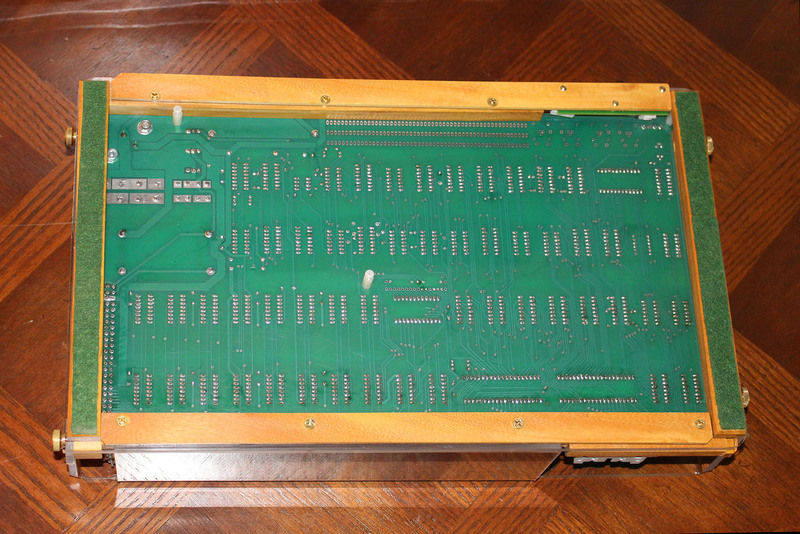 The 20 pin ribbon cable carries the 16 pin keyboard signals and the two audio channels and split at the computer base connector with 16 pins going to the Apple 1 keyboard connector and if you look carefully you can see that the other 4 signals go down into the woodwork and are routed to the AV connector on the back of the frame, the routing is not visible. The ACI signals are clearly audible during both read and write. 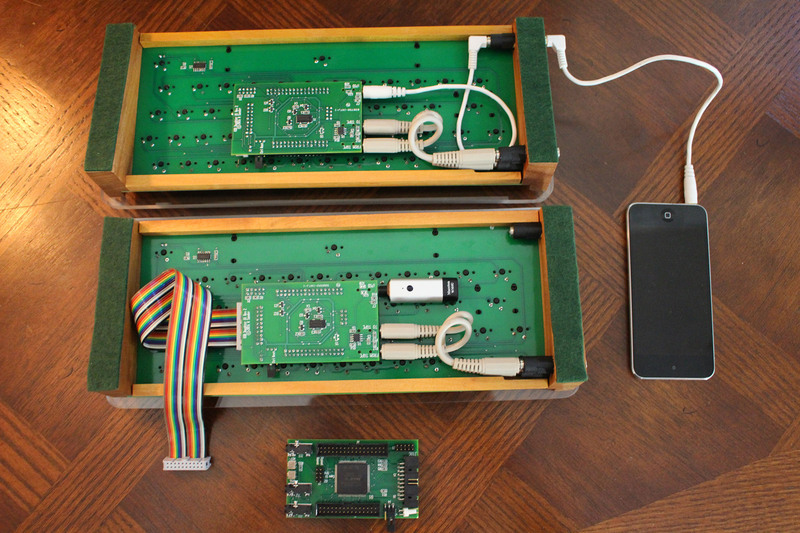 The keyboard photo shows two setups, one is the conventional connection to the iPod but the other uses a bluetooth module that allows a wireless connection to the iPod or other device for loading programs. The other side of the daughter board is also shown. The power module uses a Power Entry Connector that has a standard computer power cable input, On-Off switch and fuse module with an inline fuse and room for a spare fuse. There is also an auxiliary output power plug for the monitor and on the other side there is a USB charger outlet. The power cable and video cable are braided, braided cables are more attractive and more flexible than shrink tubing or cable ties. Very impressive! Great combination of aesthetics and practicality.